Bato disciplined one of his men again for not saluting properly to him. Cranky PNP Director General chief Ronald Dela Rosa visited Mandaluyong Police Station because he wanted to personally talk to the viral rookie cops who got involved in police brutality caught on cam. 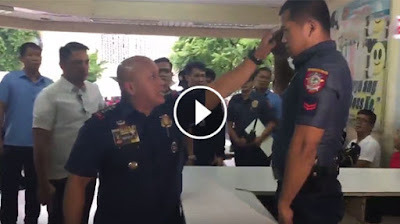 In a video uploaded by News5, it shows that when Bato entered the police station, he was quickly disappointed after he saw the police desk officer assigned in the precinct didn’t knew how to salute properly to the PNP Chief. Because of that, the police desk officer received a short lecture from the irritated PNP Chief. “Ayusin mo yan ah,” Bato told the police desk officer. Bato positioned the hand of the police officer to the correct position. Then he inspected the cop from head to toe to check if he already saluted properly. After his short lecture to the police desk officer, PNP Chief Bato walked inside the police station to confront the two cop involved in the viral police brutality video identified as Police Officers Tandog and Enriquez.